Funeral services for Mary Will Simpson Corley, 94, of Auburn, AL will be on Friday, October 26, at 10:00 a.m. in Auburn Memorial Park. A memorial service will be held afterwards at 11:00 a.m. in the First Presbyterian Church of Auburn. Visitation will be held at Jeffcoat-Trant Funeral Home on Thursday, October 25, 2018 from 5:00 p.m. to 7:00 p.m.
Mrs. Corley, who died peacefully at her home in Auburn on October 21, 2018, was born March 18, 1924, in Tallapoosa County, AL to Hollis Mainard and Gladys Grimsley Simpson. She was a graduate of Newsite High School and Draughon Business School. She worked as a secretary on Dauphin Island during World War II. She was a resident of Auburn for 70 years. 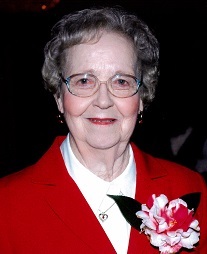 She was a long-time member of Auburn First Presbyterian Church. She was involved in several community activities including Auburn University Campus Club, Women of the Church, Tidy Tigers, Village Garden Club, Wednesday Bridge Club and Sewing Circle. She was a n excellent seamstress and loved making clothes for her daughter and granddaughters, along with quilts, and other items. She also enjoyed growing flowers and had a certain flair for arranging them. Her husband, Tom E. Corley, grew and registered a “Mary Corley” camellia with the American Camellia Society. Mary was a loving wife, mother, grandmother, great-grandmother, and sister. She liked to laugh and always tried to look at the bright side of life. She is survived by her son, Tom, Jr. (Sue) of Lakeland, FL; her daughter, June of Loachapolka, AL; two grandchildren: Stacey Jenkins and Pamela Todd (Jason) both of Lakeland, FL; four great-grandchildren: Clay Jenkins, Emily Jenkins, Brody Todd and Colby Todd of Lakeland, FL; a sister, Annie Paul Cook of Alexander City, AL; and brothers: H.M. Simpson (Jeanette) of Alexander City, AL, and William Grimsley “Buddy” Simpson (Charlene) of Ashville, AL. She was preceded in death by her husband, Tom E. Corley; her parents and sisters, Sarah Neil Wilson, Helen Walker, Daphine Chapman, Johnie Yates, and Shirley Bice, all of Alexander City. In Lieu of flowers, donations may be made to the Auburn First Presbyterian Church, 143 East Thach Avenue, Auburn, AL. 36830, or to a charity of your choice.